Commuting to work on your bike will not only save you money on fuel, but also reduces your environmental impact. But to make your commute as smooth and comfortable as possible, you need the right bike pedals. Pedals designed for city bikes are the best option, but finding the right pair can be a challenge. Dual-sided, Clipless or Platform: When looking for city bike pedals, you’ll find platform, dual-sided and clipless. The right choice for you will depend on your personal preference and riding style. For city biking, many people prefer clipless because they make frequent stops. But dual-sided pedals (which offer both types) also provide flexibility, so you can choose either one. Clipless pedals will require cleats that attach to your bike shoe, so keep this in mind. Look vs SPD: Decide whether you want SPD or look style pedals. While more of a personal preference, look pedals are often the preferred choice for serious bikers and touring. For commuting, SPD pedals are a great option, and the go-to choice for most bikers. Size: Consider the size of the pedals to make sure they’ll fit your bike. The pedal’s dimensions can be found in the product description. The manufacturer may also list specific types of bikes that the pedals may or may not be compatible with. Wellgo MG-1 – Wellgo’s MG-1 commuter pedals feature magnesium bodies, MG-1 sealed bearings, and CroMoly spindles. Dimensions of 114.6mm x 106.2mm x 30.8mm allow these pedals to fit most commuter bikes, and the pedal body is available in four colors: black, white, red, and silver. Highly durable, these pedals can withstand the abuses of the trail, but they’re lightweight enough for easy city riding. A grippy surface also keeps your feet on the pedal and helps prevent slipping in wetter weather. These MG-1 pedals from Wellgo are clipless, too, so you can enjoy the freedom of riding without having to invest in a pair of riding shoes. Wellgo Commuter Road Bike Pedal – Wellgo’s Commuter Road pedals are ideal for city bikers. An aluminum black body allows these pedals to fit seamlessly with most bikes, and the dual-design provides riders with flexibility. One side features Shimano SPD clipless, and the other side is platform for extremely versatile pedals. These pedals are compatible with Shimano 51 or 98A cleats, which are also included. Dimensions of 93.5mm x 66mm x 28.5mm allow these pedals to fit on just about any city bike. If you’re looking for more flexibility with your bike pedals, the Commuter Road is a great option, and allows you to switch between clipless and regular shoes. Mayco Bell Platform Commuter Bike – Mayco Bell’s platform pedals are clipless and feature reflectors on both sides. Ideal for commuter bikes as well as mountain and folding bikes, these pedals are highly durable with a Cr-Mo 9/16” axle. The great thing about these pedals is that you can push them toward the crank to fold up. With a weight of around 430g, these pedals are a bit on the heavy side, but are exceptionally durable and fit perfectly on just about any bike. If you have a folding bike, these platform pedals from Mayco Bell are a great option, and they’re incredibly easy to install. Shimano PDT400 – Shimano’s PDT400 Clickr pedals are ideal for commuter bikers who prefer cleats, and can appreciate the efficiencies of clipless systems. These pedals are exceptionally easy to use, which makes them a great choice for commuting. But you can also use them for touring, leisure riding, or any other type of riding that requires frequent stops. Dual-side entry offers convenience, while pop-up cages allow for quick and easy gripping of the cleats. The spring tension can be adjusted to your preference. 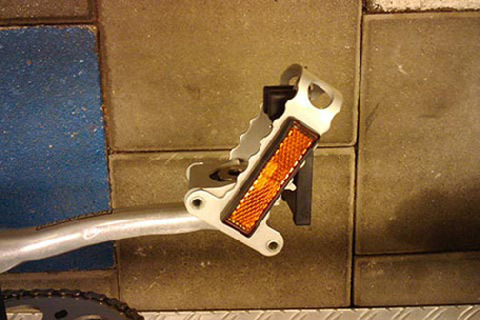 Reflectors are built-in to both sides of the pedal for improved visibility. A pair of SPD cleats are included, so you can start riding right away. Diamondback Trace Dual Sport Pedals – Diamondback’s Trace pedals are dual-sided, allowing for more flexibility and versatility. One side is platform, and the other SPD. An alloy body and chromoly axles make these pedals highly durable, and at just 440g per pair, they’re lighter in weight. The Trace pedals offer four degrees of float, so you can find the most comfortable position for your feet. They also allow for adjustable tension. Diamondback includes a pair of cleats, but these pedals are also compatible with Shimano SH-51 cleats. For commuters who may also go trail riding or touring, the Trace pedals are a great option because they offer versatility. If you bike to work, investing in the best shoes for bike commuting and the best pedals will make your rides more enjoyable. Pedals may seem like an insignificant component, but they make a world of difference if you’re constantly making stops or walking. Cleats: If you’re considering clipless pedals, you’ll also need to consider the type of cleats you’ll need. Most come with cleats, but it helps to know this information if you ever need to replace them or you already have a pair. Durability: City streets aren’t exactly rough terrain, but you still want pedals that are highly durable. The less often you have to replace them, the more money you’ll save. And if you ever do take your bike for a spin on the trail, you won’t have to worry about them getting damaged along the way. Adjustability: Some pedals have different degrees of float, so you can choose a position that’s comfortable for you. Others also have adjustable tension. If comfort is your top priority, you may want pedals that offer these features. Folding Design: If you have a folding bike, you may also want pedals that fold up. The Mayco Bell pedals, for example, fold up by simply pushing the pedal toward the crank. Cost: Commuter bike pedals are affordable, even for some of the best models on the market. That’s great news for bikers, but it’s easy to be tempted by the rock-bottom prices of poor-quality models. Always opt for quality over price.